The Scottish surgeon Archibald Blacklock is chiefly remembered today for the events of the night of March 31st, 1834, when he was one of a small group who entered the family mausoleum of Robert Burns in order to make a plaster cast of the poet’s skull. Some small portions of black hair, with a very few grey hairs intermixed, were observed while detaching some extraneous matter from the occiput. 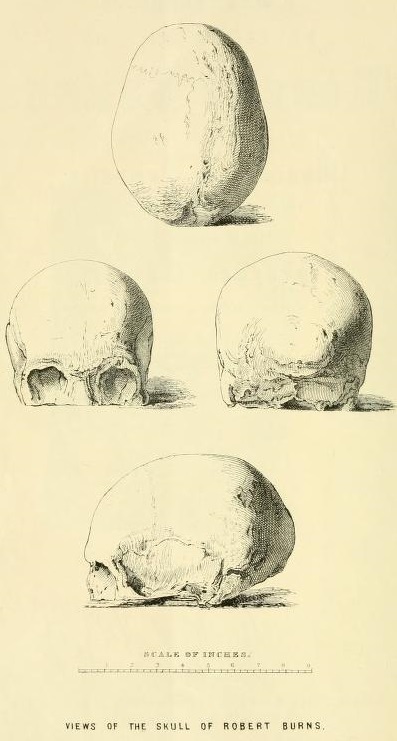 Indeed, nothing could exceed the high state of preservation in which we found the bones of the cranium, or offer a fairer opportunity of supplying what has so long been desiderated by Phrenologists — a correct model of our immortal Poet’s head. A pamphlet about Burns’s skull by the preeminent phrenologist of the day, George Combe, was later published – you can read it here. Blacklock, who died in 1875, was eventually buried a few yards away from the Burns family tomb in St Michaels Church in Dumfries. While some boys were bathing in the Nith, on Saturday, 10th April last, one of them, James Wilson, between 9 and 10 years of age, fell upon a broken wash-hand-basin, which inflicted a wound in the abdomen, extending from a little below the umbilicus, three inches down the linea alba, or, in other words, nearly to the pubis, through which the greater part of the small intestines, the transverse arch of the colon, and the omentum, immediately protruded. In other words, the wound extended from the navel to the groin. A three-inch incision doesn’t sound much but the placement was unlucky, since much of the bowel emerged through the opening. 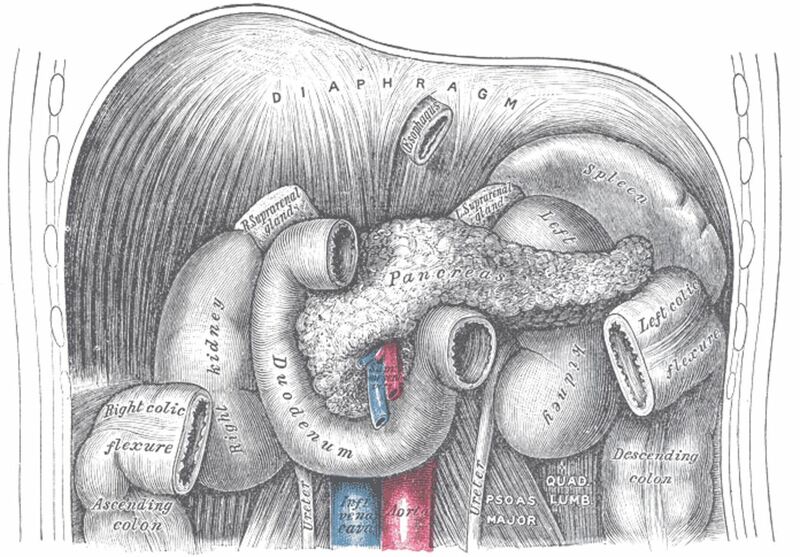 The omentum is the apron of fat which usually covers the bowel. When I first saw him, he had been lying upon the bank of the river upwards of an hour, and the protruded parts, which were chiefly hanging over his left thigh, had evidently been in contact with the ground, for a considerable quantity of sand, withered grass, and other extraneous matters, adhered to them; and, from long exposure to the atmosphere, and fruitless attempts on his own part to force them back into the abdomen, they had become of a deep red colour. A nightmare. Imagine the microbial life which was now teeming all over his internal organs. The experience must have been horribly traumatic as well as unimaginably painful. Washing the bowel in the open air with a sponge and water of dubious provenance may have been better than doing nothing at all, but the boy’s chances of developing a fatal infection were still extremely high. The doctor now attempted to return the bowel to the abdomen, a process known as reduction. The reduction even was by no means so simple and easy a process as some might suppose; for it frequently happened that patches of sand, etc., which had not previously been observed, were brought into view, as convolution after convolution of intestine was about to be replaced, and of course had to be washed off before the operation could he proceeded with. I may therefore safely say, that it was fully an hour and a half from the time that the intestines were immersed in the cold river until they were fairly returned into the abdominal cavity. An hour and a half when the poor boy was sitting on a riverbank with his bowels lying on his thigh, without any pain relief. The whole, however, being replaced, and the omentum spread out, so as to come as much as possible between the intestines and the external wound, the lips of the latter were immediately approximated, and secured in contact by three interrupted sutures, which were afterwards supported by strips of adhesive plaster. The unfortunate boy was now conveyed to his father’s house in Dumfries, about a mile from the place where the accident occurred; and three hours after, when reaction had fairly commenced (for, in the first instance, or at least from the time of my arrival, he was pale and almost pulseless, although little or no hemorrhage had taken place), twelve leeches were applied, and a grain and a half of calomel, combined with one-twelfth of a grain of opium, directed to be given every two hours. Calomel was a purgative, intended to empty his bowels; opium was for pain relief – and doubtless extremely effective. The leeches are unlikely to have done very much. April 19th.—The bowels have moved twice since yesterday, when the enema was administered, both evacuations of natural appearance, and well formed. From this period he daily gained strength. On Monday, 5th May, returned to school ; and up to this date continues perfectly well. Mr Blacklock concludes with a touching tribute to his young patient. In this instance the patient had enjoyed excellent health up to the time of the accident, and possesses a fine quiet amiable temper. Indeed, a more tractable and heroic patient never came under my observation, either at home or abroad —in peace or war; and his composed state of mind no doubt greatly facilitated the healing and restorative process, and conduced to his rapid and complete recovery. He was unlucky to have his guts spilled out, but lucky to not have punctured them.